Edited by Federico Piscione . 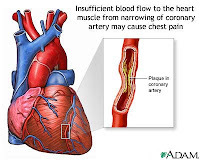 Angina is the most common disorder affecting patients with ischemic heart disease. Indeed, the reported prevalence of angina approximates 10.2 million patients in the USA and it has been estimated that 500,000 new cases of stable angina occur each year. In this book we reviewed the novel mechanisms, such as inflammation factors and genetic determinants, that play a pivotal role in the pathophysiology of angina and that might have potential therapeutic implications in the future (Chapter 1). In addition, because of its prevalence, it is important to distinguish angina due to ischemic heart disease from angina-like chest syndrome, due to digestive tract disorder. At this regard, the pathophisiology, the diagnosis and the treatment of angina-like chest syndrome were carefully reviewed (Chapter 2). The treatment of angina is based on several conventional agents, nevertheless new drugs with novel mechanism of action, i.e. ranolazine, nicordandil, ivabradine, have been proposed in specific subsets (Chapter 3). However, nitrates, calcium channel blockers and beta adrenergic blockers are the most widely used and studied antianginal medications, representing the cornerstone in the treatment of angina secondary to coronary artery disease (Chapter 4 and Chapter 5). Finally, the role of enhanced external counterpulsation and alternative non-medical, non-surgical therapies were also reported, focusing on their potentials, as well as their current limitations. Therefore, this book provides a thorough review of fundamental principles of diagnosis, pathophysiology and treatment of angina pectoris, representing an invaluable resource not only for cardiologists, but also for general practitioners and medical students.